Why should all the juices be sweet???? Since its super hot summer at Chennai already, I thought of posting some chill juice varieties to beat the heat. 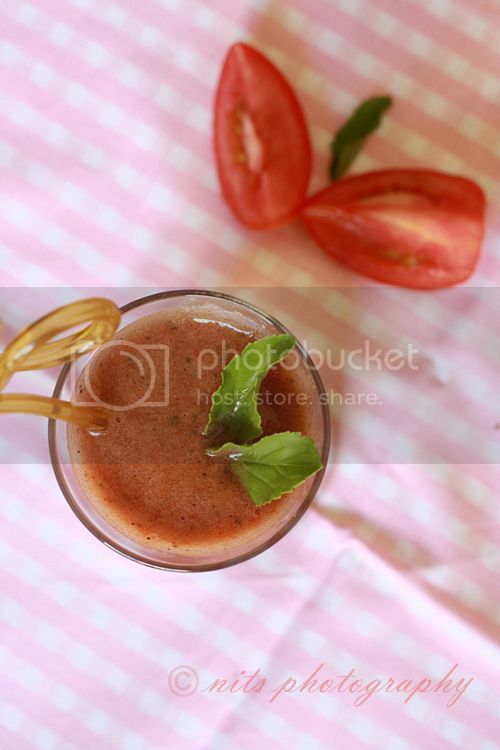 Hence I shall be posting 1 juice recipe per week under this Summer special series :) Keep watching. 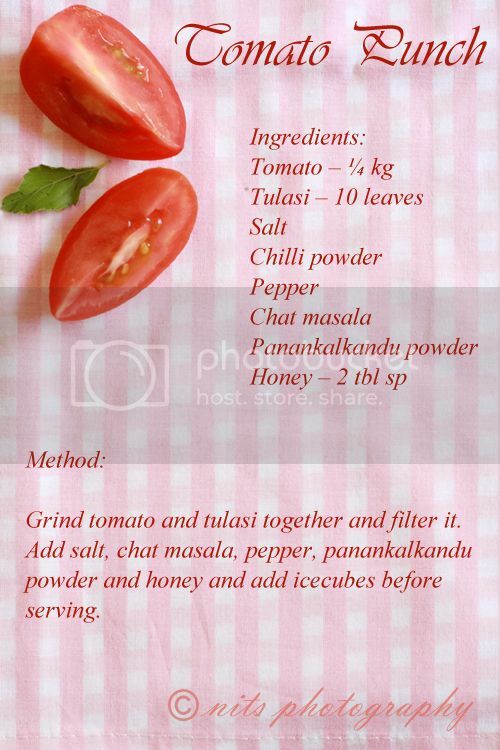 Grind tomato and tulasi together and filter it through a sieve. 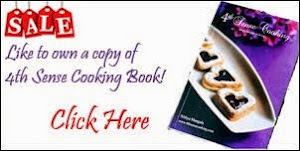 Add salt, chat masala, pepper, panankalkandu powder and honey and mix well. Serve topped with ice cubes and tulsi. 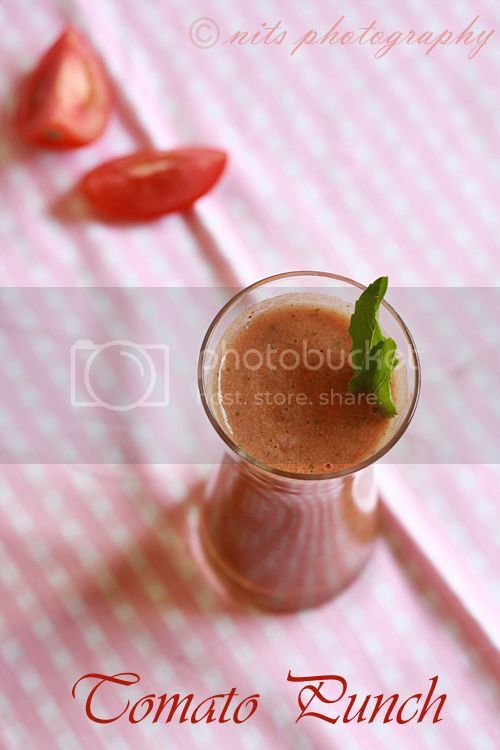 healthy drink..good for throat too..nice clicks..
Never thought of a spicy version but the outcome is so great. Yum to this healthy and that tinge of spicy flavor. wow, very new and delicious. Please do send it to my "Healthy Me & Healthy Us" event (read the rules). 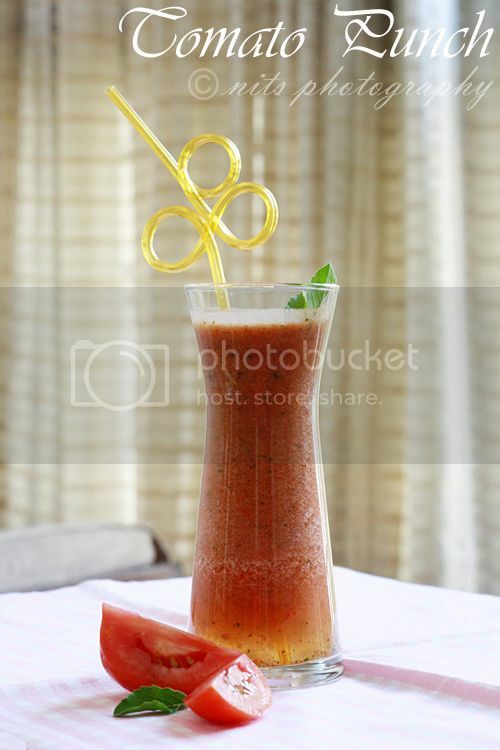 perfect drink to get totally refreshed..
its like indian style bloody mary drink. Looking delicious. Love the addition of some chili powder to the juice. A spicy and chilled soup is what is called the Gazapacho soup mostly in south america..during summer. This one looks like you`ve added a lot of punch - tulasi which has a spiciness in itself, pepper and red chilli powder. Must be tasting yum! looks very inviting ...lovely clicks..